AUSTRALIAN rookie punting sensation Michael Dickson will be the Seattle Seahawks' not-so-secret weapon when they take on the Chicago Bears on Tuesday. With the 22-year-old former Sydney Swans Academy member having broken records, topped all other punters and stunned the NFL in last week's debut, the Bears are wary heading into 10.15am Tuesday AEST clash in Chicago. The game is ESPN's Monday Night Football broadcast so Dickson will be punting in front of a TV audience of about 10 million viewers. "He's real good," Bears special-teams co-ordinator Chris Tabor told reporters. "He doesn't give you a lot of chances to return the ball so we have our hands full with this guy. "It's going to be an interesting challenge for us." Dickson, from Sydney's Sutherland Shire, became the first player in NFL history to boot six or more punts for an average of 59-plus yards in last week's debut against the Denver Broncos. He was helped by Denver's thinner air because of the city's high elevation, but his historic performance in his first NFL regular season game has made him a star and a headache for opponents. After the Denver game the Seattle Times ran the headline, "Best game ever by a Seahawks punter? An NFL punter?" 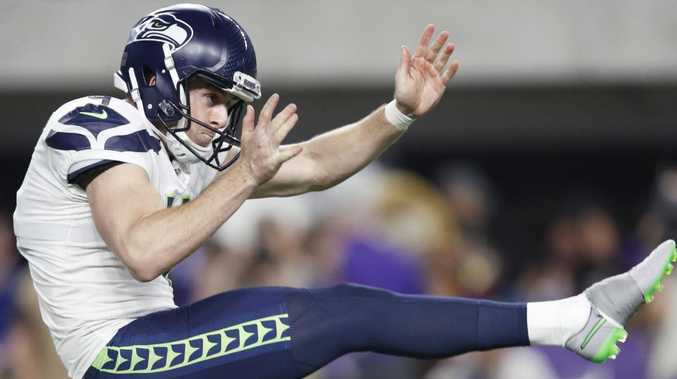 Other reports had the headlines "Seahawks rookie Michael Dickson is a punting god" and "Seahawks rookie Michael Dickson is the world's most captivating punter". Dickson repeatedly punted the Seahawks out of their own territory and pinned the Broncos near their end zone. The Times reported analytics estimated Dickson's punts were worth 9.66 points for the Seahawks in their 27-24 loss in Denver. "What's really been impressive about him obviously is his direction, but also his get off time - how fast he handles the ball and gets it out and the location," Tabor said. Another Australian rookie punter, the Philadelphia Eagles' Cameron Johnston, is also causing a sensation and breaking NFL records. His 53.9 yards per punt average after two games was reportedly the highest in 49 years in the NFL and the third highest in the history of the league. Dickson and Johnston are both graduates of Nathan Chapman's Melbourne-based Prokick Australia punting school.